My favorite traditional German potato salad dressed with a dijon vinegar dressing and served warm. The perfect cold weather side dish! While I fully embrace all my German-ness, it’s going to be… interesting to have the same conversation after the wedding, except with a Polish name. Can’t wait to share stories of how that goes down. Also, I guarantee there are going to be a lot of occasions where someone says, “Mrs. Kiszka?” in a waiting room and it’s going to take me an awkwardly long amount of time to realize they’re talking to me. What does that have to do with this recipe, you ask? It really doesn’t, other than the fact that my name is German and this recipe is also German. Crazy coincidence! But not really. This is one of my favorite German recipes. It goes Apple Strudel, this, and then every version of schnitzel and sausage you can think of. If this isn’t served alongside my beer and meal, the meal is. not. complete. I’ve been making this for as long as I can remember. I usually wing the measurements because I have the recipe committed to memory and I just eyeball it all, but I put it all in writing JUST FOR YOU. You’re right for feeling special. This is a special moment. The amount of potatoes and bacon can be whatever you want your ratio to be. I’ve been known to put an entire of package in with this, and there’s no part of me that’s even slightly sorry about that. Here’s the thing about German potato salad: you serve it warm. Don’t freak out – I’m not asking you to leave a cold potato salad at room temperature until it goes bad. This bad boy is meant to be served hot off the stove. 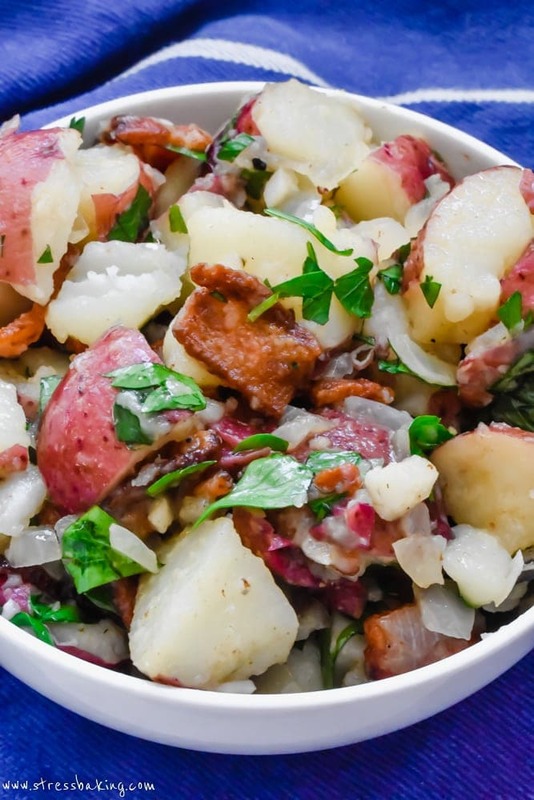 It’s cold weather’s favorite potato salad. Also there’s no mayo in sight for this recipe because it uses a dijon mustard and vinegar dressing. If you’ve never had this before, I highly recommend you widen your horizons and try this right now. No, really, right now. Go to the store and then get to boilin’! Prep: Slice bacon into roughly 1″ pieces, dice onion, mince garlic. Set aside. In a small bowl, stir to combine vinegar, water and sugar. Set aside. Fill a large pot with potatoes and fill with enough cold water to cover them. Add a pinch of salt and bring to a boil. Once boiling, lower heat to medium high and let simmer for 15-20 minutes or until easily pierced with a fork. Drain, and return to stove top (without heat) and let sit while you prepare the rest of the ingredients. In a separate large pot over medium heat, heat bacon until browned and crispy. Turn off heat and remove bacon from pot with slotted spoon and set aside in a bowl, leaving bacon grease in pan. While grease cools a bit, cut potatoes into smaller chunks, roughly 1″ in size. Set aside. Carefully add onions to pan and heat, stirring frequently, for a few minutes over medium heat. Add garlic and stir frequently for an additional minute. Carefully add vinegar mixture, mustard, salt and pepper and stir to combine. Let simmer for a couple minutes then remove from heat. Add diced potatoes and bacon into pan, and gently stir to combine. Add parsley and stir a couple times to combine. 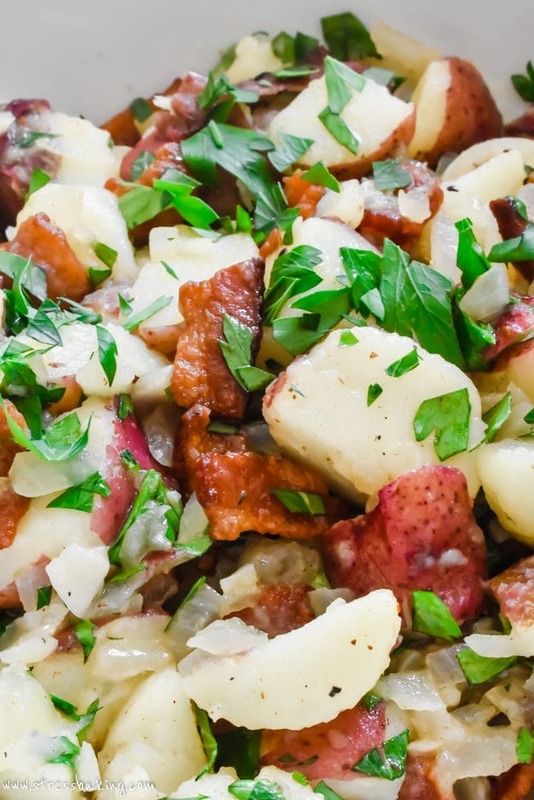 Love potato salad…and this recipe looks amazing. 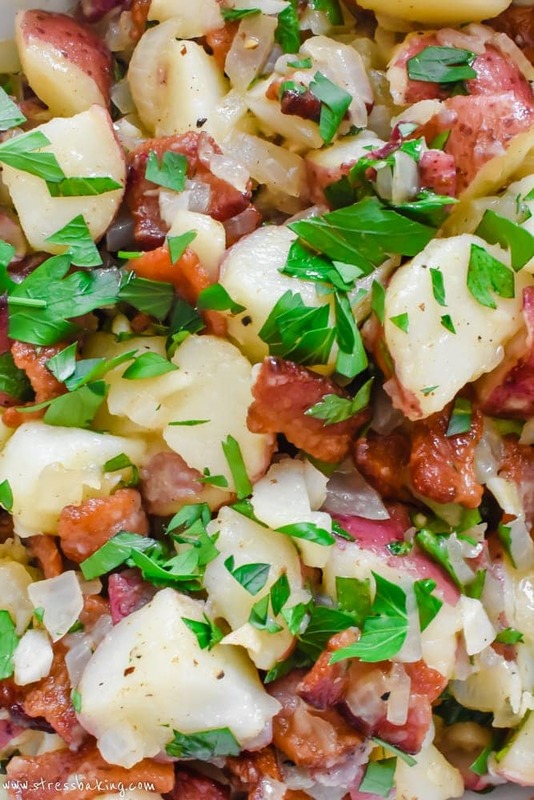 Warm potato salad is so good, and you can never go wrong combining bacon and potatoes. Great for a brunch or dinner side dish…and the perfect BBQ salad too. I did an exchange in Germany in high school and have visited a few times, I love German food so so much! This salad looks so tasty I am literally drooling right now! I totally feel your pain! My parents gave me the little spelling gem that is Clairellyn for a first name, and then I married a Norwegian guy so my last name is now Tollefsen. So, in other words, no one can spell my first or last name, let alone pronounce them most of the time. On top of that, my husband’s name is Kim, so we’re just a regular ol’ barrel-of-monkeys-level fun for the baristas at Starbucks. XD Your German potato salad looks delicious! Salad looks so comforting and like a complete meal for me. Love Potato salad always. I have the same issue with my name. No one spells either correctly and it drives me nuts—my parents spelled my first name though unlike the typical spelling so I blame them for that. This salad looks like it’s hapoening very soon for us!! Such a delicious and classic recipe – I especially am loving the dijon vinaigrette dressing! Light and flavorful all at once! Dijon and vinegar dressing sounds better to me than mayo! This salad looks amazing, love that it is served hot! Perfect Thanksgiving/Christmas side dish (or any weeknight meal 😉 ). 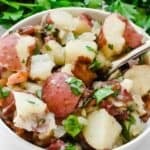 I love how easy this potato salad is! I can’t wait to make one at home!!! LOL I hear you (says Anne with an E, thank you for asking… Murphy – no, not Murray, Murthy, or even Kelly – what??!) Amazing what people can do with names. And I’m looking for new potato recipes – the parents enjoy them – so this is going into the rotation! 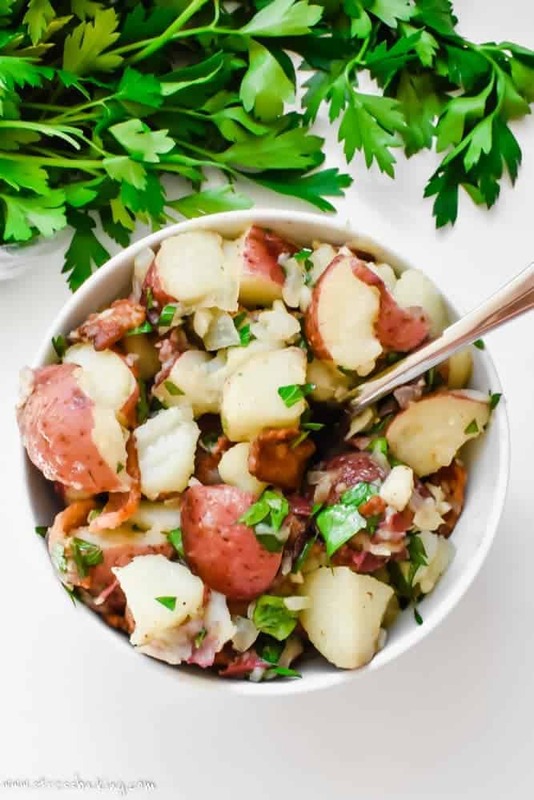 I love potato salad and this one looks amazing. The bacon in this is the perfect touch. 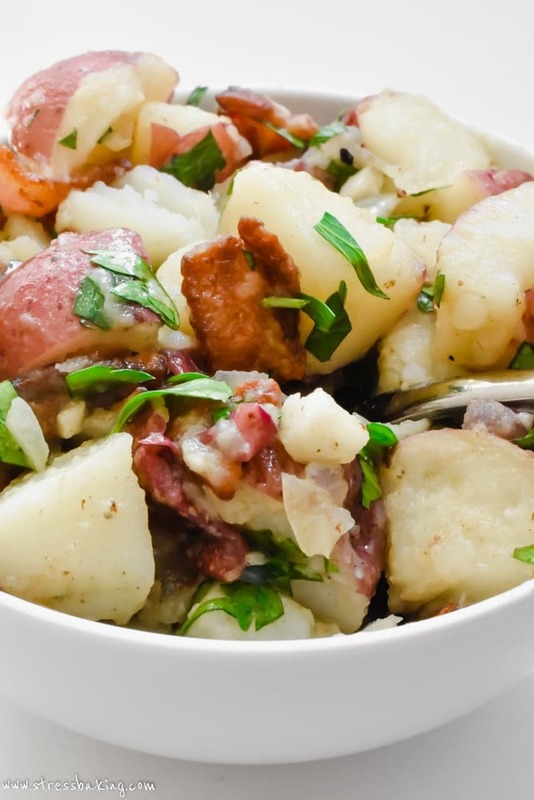 I love vinegar-based potato salad — so much better than mayo or yogurt based. And no need to worry about how long it sits out for hot summer picnics! 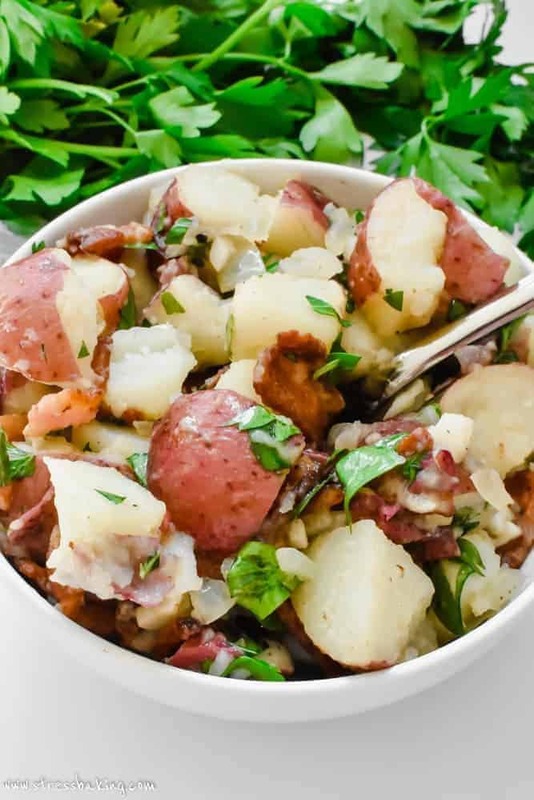 I love potato salad but have never tried it with a dijon vinegar dressing. Excited to try this flavour combo, yum! 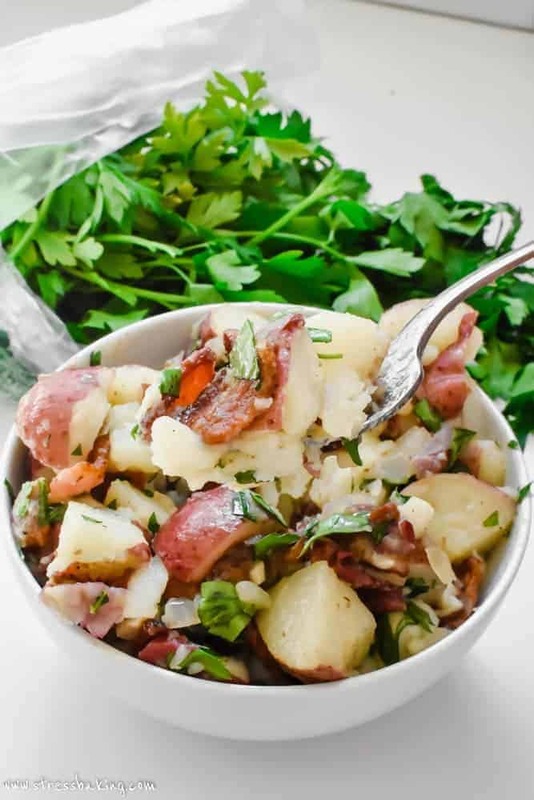 Your recipe for German potato salad with a dijon mustard and vinegar dressing – what’s not to love? It certainly wouldn’t stay on the plate long in our house!